He is an assistant director in the Center for Student Success. He is also an advisor, teacher, alumni, sports lover and overseer of all Robert J McGuire scholars at Saint Francis College. The Robert J McGuire scholarship is a program that helps people who are from low socioeconomic backgrounds have the opportunity to attend college. Anthony Desiderio oversees the students in the program by ensuring that all McGuire Scholars graduate on time with a four year degree. He provides immediate support by staying in touch with each a student and preparing graduate plans for all students in the program. Anthony supports all students outside the classroom. He supports students’ athletes here at Saint Francis college because he has a special connection to sports. “I am a big fan of basketball. I support the men’s basketball team and every other sports team at Saint Francis,” Anthony said. “It is inspiring to me to see students outside the classroom setting”. He also teaches a Freshman seminar course in which students are given guidelines on how to be successful throughout their college career. As a Brooklynite native of Sheepshead Bay, he heard of Saint Francis College through a family friend. He started off as a freshman in 2009 majoring in sports management and business. It was during the first two years, Anthony struggled as a student and was placed on academic probation. However, the constant guidance the SFC faculty provided allowed Anthony take a new academic perspective. He took one psychology class and that was all it took to find his academic passion. He graduated in 2015 with a master’s degree in psychology and was offered a job here at Saint Francis 3 months after graduation. 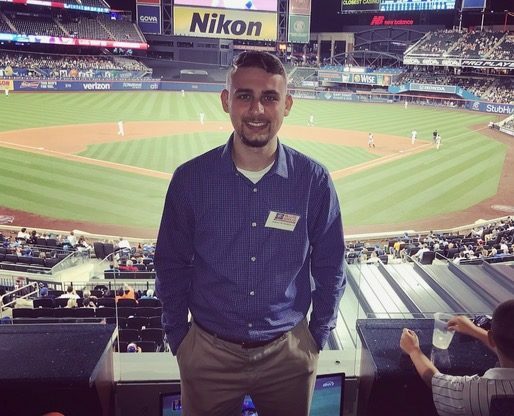 Anthony Desiderio’s goal is to provide a support system for students at Saint Francis College. He says “success isn’t monetary, be happy with what you do”. It is suitable to say that Anthony is a living proof of what that quote means, and he is indeed more than an advisor.